Thurs Aug. 8, 9:00 p.m. - 12:00 p.m.
Fri Aug. 9, 9:00am - 9:00p.m. Sat Aug. 10, 9:00am - 9:00 p.m.
Sun Aug. 11, 9:00am - 5:00p.m. It is our goal to relate the history of our charming town. Bentley, Alberta lies like a jewel in the beautiful Blindman Valley, a geographic feature that caught the attention of many of the early pioneers. A spectacular view greets you as you enter the town from the east. 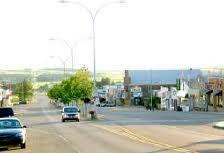 Immediately before you is the Town of Bentley and in the distance are the famous “Sunset Hills”. On a clear day, you can also see the snow capped Rocky Mountains. You are treated to equally magnificent views when you top the rim of the valley from the south or west. In 1899, Major William McPherson and his sons purchased homesteads, land that is now the centre of our town of Bentley. The McPherson’s operated a store and built a cheese factory. Read how they influenced the growth of the town and its people. We will share with you the stories of the hardships, joys and difficulties these early pioneers faced and how they coped with the elements that shaped their way of life. You will see how a ravaging fire in the early 1900s destroyed the business section on one side of Main Street. Come and learn more!! !